Nowadays, mobile phones play an increasingly important role in our daily life. Text massage is the second most important function of mobile phone, and text messages on mobile phones store a lot of important information. We often use mobile phones and family, friends send text messages. In modern society, people always use send text massages to our families and friends. These text massages may contain many precious memories: they may be parents' daily care and advice; they may also be encouragement and support from intimate friends, or they mat be husband's/wife's warm leveret. These messages are so precious; no one is willing to lose them. However, sometimes we accidentally or angrily deleted these massages, what approach can be adopted to solve this problem? Whether the deleted text messages are recoverable or not has nothing to do with time. If the storage of a phone is 50 text messages, receiving or deleting text message is like writing or erasing letters on a 50-line paper. Even the letters are erased, there is still trace left. But if new letters are written on these trace, it would be impossible to recognize what the original letters are. That is to say, after text messages are deleted, if no new data overwrites the old data, it is possible to recover the deleted messages on HTC phone. In such case, it becomes particularly important and emergent to restore the deleted SMS from HTC One or Desire. 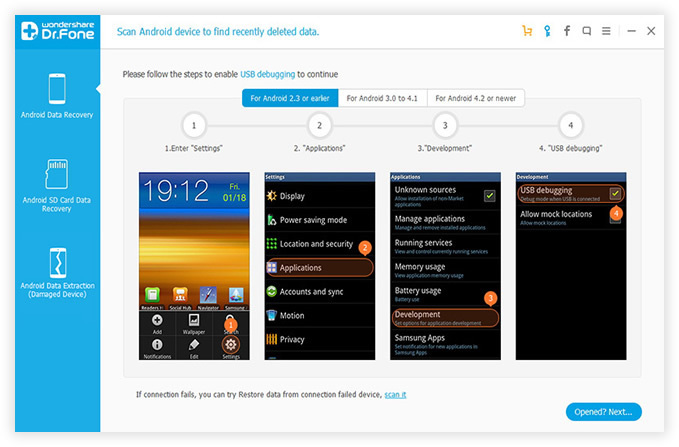 But don't worry; now advanced mobile phone software - Android Data Recovery can help you to solve this problem. It is capable of restoring various forms of data, such as text messages, images, documents,, video, music, etc. 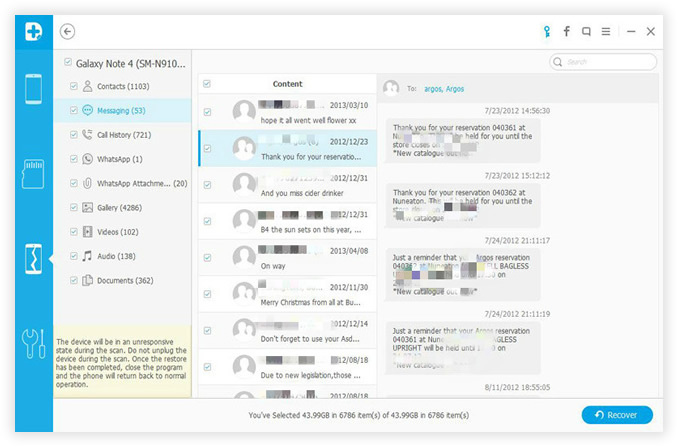 In addition, this program is characterized by its easy-to-use graphical user interface which would guide you through the operational process and allows you retrieve your files within only several clicks. The first thing that you need to do is go and download a program, clicking on Download and installing the program. Then connect your HTC phone to your computer by using USB cable. To get started, you need to double-click the program, which brings up this window here. 3) For Android 4.2 or newer: "Settings" < Click "About Phone" < Tap "Build number" for several times until getting a note "You are under developer mode" < Back to "Settings" < "Developer options" < "USB debugging"
Once the device is detected by the software, select "Messages" from file type and click "Next " to choose "Standard mode". click the "Start" button to begin analyzing the device attached to the computer. Make sure the battery life is more than 20% and don't connect other device to the computer during the time. 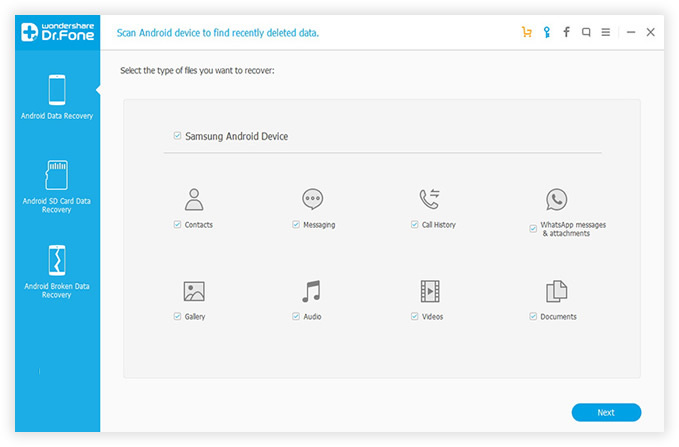 The whole analysis takes 10-20 minutes to complete, depending on how many files stored on your Android phone. After analysis, t he scanned data will be listed by categories on the left menu after scan processing finished, you can choose the categories to preview whether it is the one you want, and mark before the file name. 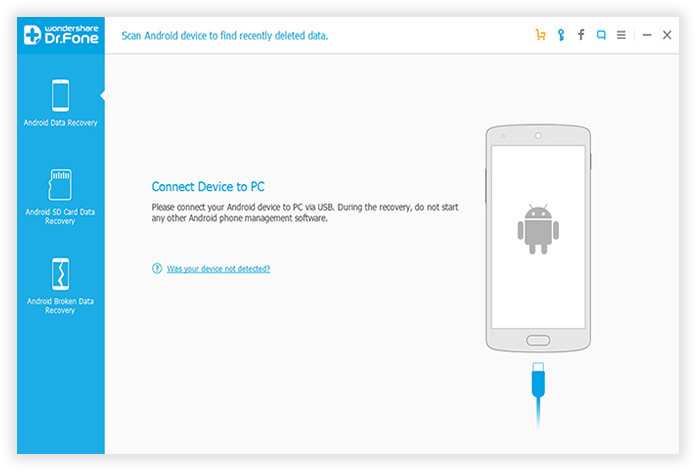 Then Click on the Recover button on the bottom of the screen, and choose a local path to save your deleted messages or other data. If your HTC device have been formatted or restored factory settings, or your HTC device has already reformatted or crashed accidentally, please don't save anything new to the device or receive or send messages. If no new data overwrites the old data, it is possible to recover deleted messages from your HTC one or Desire. And meanwhile, it is of great significant that some text messages should be well cherished and you are required to back up your own data periodically to protect against loss.